In its admissions process, Mount Aloysius reviews each applicant’s academic background, high school activities, SAT, ACT, or CLT scores, and academic potential. This process is personal. The College makes every effort to discuss the admissions process and requirements with every prospective student. Accordingly, students who will benefit from the College’s opportunities for intellectual, moral, social, and professional growth are encouraged to apply. Applications will be accepted throughout the year. Prospective students seeking full- or part-time admission are also urged to contact the Admissions Office in person, by letter, by telephone, or by e-mail/web to benefit from the College’s personal admissions approach. Health forms including health history, physical exam and immunization record, are obtained from the Health Services Office website. Completed health forms are returned to the Director of Health Services and kept confidential. Health forms are required of all students prior to the start of classes. An official copy of the secondary school transcript must be sent directly from the high school to the Vice President for Enrollment Management. The transcript should include all pertinent data available, including the SAT, ACT, or CLT results (if required). Persons presenting a GED diploma must have the scores forwarded from the testing center to the Office of Undergraduate and Graduate Admissions. Students who have previously attended college will be accepted as degree candidates if they fulfill the requirements for entering freshmen. An official transcript from each college or university attended must be submitted along with a course description for each class a student may wish to have considered for transfer to Mount Aloysius College. Students who have completed at least twelve (12) credits at another college or university but did not obtain a degree must submit a College Clearance Form signed and completed by the Vice President for Student Affairs/Dean of Students at the students’ previous institution of higher learning. The Office of Undergraduate and Graduate Admissions supplies the form to the transfer student. An official copy of the college or diploma school of nursing transcript must be sent directly to the Vice President for Enrollment Management. The transcript must indicate the date, type of degree, and field of study. Students may be admitted to the College on a non-matriculated (non-degree seeking) basis and continue under this status until fifteen (15) credit hours of course work have been earned. At that time, admission (matriculation) into a specific degree program is required in order to permit continued enrollment in Mount Aloysius College courses. Please refer to the above mentioned admission requirements for the Associate and Bachelor degree. See also Matriculation elsewhere in this catalog. Mount Aloysius students who leave the College for one semester or more must reapply to the institution through the Office of Undergraduate and Graduate Admissions. Readmitted students need to place their intent in writing to the Vice President for Enrollment Management. Once the letter is received, it will be processed through all key departments and offices. Students who were academically dismissed and are seeking readmission must follow academic standing policies as indicated in this catalog. When granted readmission, students will follow rules and policies listed in the catalog that is in effect at the time of their re-entrance to the institution. Students who completed other college courses during any interim will need to submit an official transcript from the institution they attended. Courses with a “C” letter grade or better will be evaluated as indicated in the transfer policies of this catalog. Students called to active duty in the United States Armed Forces or the National Guard or Reserve for a period of more than thirty (30) days are entitled to re-enroll at the institution. Please contact the Registrar’s Office for the complete Veterans’ Readmission Policy. All students who are accepted to Mount Aloysius College through the Office of Undergraduate and Graduate Admissions are asked to pay a $200 tuition deposit/reservation fee which will guarantee their place in each respective fall and spring class. The deposit is deducted from the student’s account/tuition. Payment schedule is clearly outlined in the student letter of acceptance from the Vice President for Enrollment Management. Students who request a refund in writing prior to May 1 for the fall semester will be reviewed for a refund when an extenuating circumstance exists. Refund requests are only reviewed for students wishing to enroll in the fall semester. Readmitted students are ineligible for refunds. Mount Aloysius College does have an official housing requirement. Residential students must submit an additional $125 housing deposit to reserve a room in campus housing. Residential/housing deposits are non-refundable. For students residing on campus for a full academic year, the fee is only charged once. Graduate students are ineligible for refunds. A high school student who has successfully completed the junior year and meets the entrance requirements of the College may be considered for admission provided the student has obtained a written recommendation from the high school principal or superintendent. Mount Aloysius College offers the ACT (American College Testing) with special accommodations to students who express and are determined to have a need. Any student seeking accommodations must meet the following Mount Aloysius College requirements. Testing will be offered twice per semester the day before the ACT is being offered at the College: September, November, February, and April. The student must provide the Office of Undergraduate Admissions with no less than one month of notice to allow for proper preparation, documentation and communication. The student must be an applicant of or a current student at Mount Aloysius College prior to requesting testing accommodations. The student may use ACT test results only for Mount Aloysius College, as per our status as a residual (non-national) ACT Testing site. The student must provide to the Department of Counseling and Disability Services official documentation outlining needed accommodations no less than one week prior to the test. The student must provide to the Department of Counseling and Disability Services an official IEP (Individual Education Plan) demonstrating an existing need for accommodations no less than one week prior to the test. The Department of Counseling and Disability Services will communicate with the Learning Commons Coordinator in a timely and effective manner to present a clear need for a proctor for an upcoming ACT. The Office of Undergraduate and Graduate Admissions will effectively communicate all Mount Aloysius College ACT dates immediately upon setting a schedule to the Learning Commons Coordinator. The Learning Specialist in the Learning Commons, as well as a back-up from the Learning Commons, will be trained each summer to proctor the ACT. The Learning Specialist in the Learning Commons will dedicate two pre-determined days each semester exclusively to test takers who have been granted accommodations through the Department of Counseling and Disability Services. In the event the Learning Specialist is not available for proctoring due to illness or other emergency, a proctor will be assigned by the Learning Commons Coordinator. Should the College close or be delayed due to poor weather or any other emergency, arrangements will be made to reschedule within the following week. Testing will take place in the Learning Commons, located within the Mount Aloysius College Library. The student must pick up official documentation from the Mount Aloysius College Department of Counseling and Disability Services. The student must submit the documentation to the ACT Testing proctor prior to beginning the test. The student must follow official ACT and the Mount Aloysius College Department of Counseling and Disability Services policies and rules outlined immediately prior to testing. International students are welcome to apply to Mount Aloysius College for both the fall and spring semesters. International students are responsible for following the same procedures as all freshmen, transfer and graduate students. The following is a list of what must be supplied or completed when applying to Mount Aloysius College as an international student. If you are an eligible non-citizen and have an Alien Registration Number, are a permanent resident and you have an Alien Registration Card or a conditional permanent resident. You are eligible to file the Free Application For Federal Student Aid (FAFSA Form) and may be eligible to receive federal and state funding such as grants, work-study and student loans. Submit a completed Application for Admissions with a non-refundable, one-time $30.00 fee. Submit official secondary school (high school) academic records (transcripts, certificates, and diplomas) with certified English translations. Students transferring from other universities should also submit all official university transcripts. We strongly encourage all students to submit transcripts using World Education Services or another member of the National Association of Credential Evaluation Services. Transcripts from students who are not required to use a foreign educational credential evaluation service and are sent to MAC directly must have the official seal of the institution. For the TOEFL, students must score above a 61. For the IELTS a 5.5 is required as the minimum score. Students below a 580 on the 2016 SAT or a 500 on the 2005 SAT Critical Reading section may be required to take our college placement exam. However, everyone is reviewed on a case-by-case basis and admission is never guaranteed. Undergraduate international students who score a 6.0 or below on IELTS (or comparable TOEFL, or other scores) will be required to take a six (6) credit transition seminar course. Students who complete English as a Secondary Language Program in the United States or come from an English speaking country are exempt, but might be required to take certain Educational Enrichment courses. The course will be available to International students who score higher on those exams but feel a need to cover the course content. International, non-native English speakers who transfer in at least 24 credits from an accredited, U.S. college/university with a 2.5 GPA or above will be exempt from the requirement to take this course. Courses from international colleges and universities will be considered for transfer credit on a case-by-case basis. These courses must be equivalent to a “C” or better and comparable to a Mount Aloysius College course after a full credential evaluation is completed. Graduate students are required to submit two letters of recommendation, a personal goal statement/statement of purpose and resume along with undergraduate final transcripts. An entrance exam may also be required. 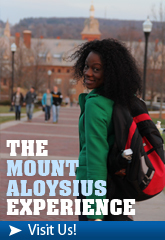 If accepted into Mount Aloysius College, an international student must return a financial affidavit form to The Office of Undergraduate and Graduate Admissions within two weeks of receiving the acceptance letter. The office will provide an I-20 form when the tuition deposit and room reservation fee of $325 is received. Your tuition and room and board fees for the first semester must be paid in full to the Business Office by the billing due date and prior to arriving to the United States. 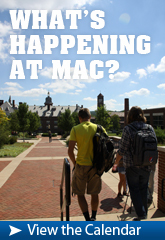 Housing is available and is mandatory for traditionally aged full-time international students during their entire time at MAC. During major college breaks, the residence halls will be closed. However, the institution will make every effort to find available off-campus housing when the residence halls are closed. For non-traditional international students, they must find off campus housing on their own. Mount Aloysius College upholds the policy for international students as set forth by the United States Department of Immigration and Naturalization, the United States Department of Homeland Security, and SEVIS (Student and Exchange Visitor Information System). Submit proof of health insurance. Health forms including health history, physical exam and immunization forms, are obtained from the Health Services Office website. Completed health forms are returned to the Director of Health Services and kept confidential. Health forms are required of all students prior to the start of classes. Students must arrive early to attend New Student Orientation before classes begin. Mount Aloysius College will consider credits for transfer into associate and bachelor degree programs from coursework taken at regionally-accredited post-secondary institutions which have received full accreditation, where the course work is equivalent to that of Mount Aloysius College and in which the student received a grade of “C” or better. Transfer credits are also granted from nationally accredited post-secondary institutions on a case-by-case basis. Transfer credits will be awarded based on the similarity of course exit competencies and is a function of course content, length, caliber of faculty, and quality of practical experiences, where applicable. As a central principle, implementation of this policy will provide equitable treatment for native and transfer students and ensure that students will not be required to repeat course work completed at an acceptable level of performance at a previously attended institution. It is the student’s responsibility to provide course descriptions and catalogs to the Office of Undergraduate and Graduate Admissions from the college or university in order to evaluate course equivalence. Failure to submit course descriptions will void advanced academic standing. Course work that has been completed seven (7) or more years previously may or may not be accepted as transfer credit. Students transferring Microbiology or Anatomy and Physiology courses must have credit for a laboratory. Students seeking transfer admissions to Mount Aloysius College will have all transcripts reviewed initially by the Office of Undergraduate and Graduate Admissions or the Office of Graduate and Continuing Admissions in collaboration with the Office of the Registrar. 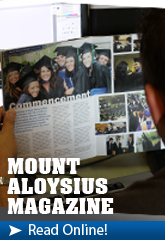 Matriculated students at Mount Aloysius College are required to obtain permission from the Registrar prior to enrolling in courses at another post-secondary institution. Appropriate faculty will be involved as needed to determine the appropriateness and applicability of accepted courses to a specific degree program. For further detailed information regarding transfer credits and the complete Transfer Credit Policy, please see the Registrar.